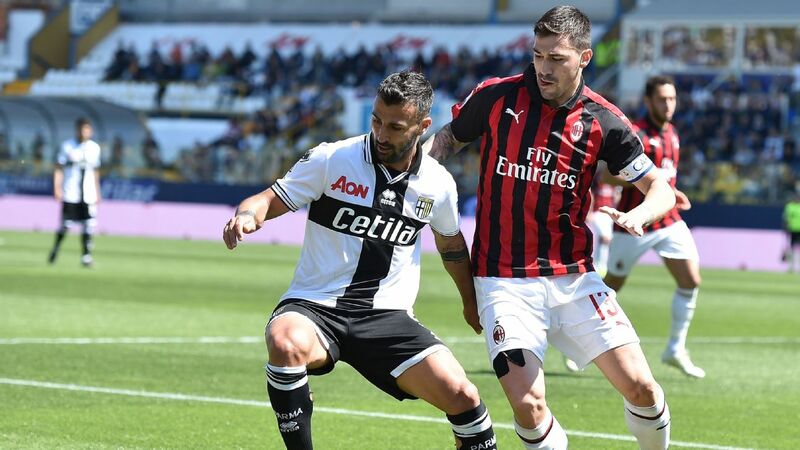 AC Milan were held to a 1-1 draw at Parma in Serie A on Saturday after veteran defender Bruno Alves scored with a majestic free kick for the midtable hosts with three minutes left. The 37-year-old Portugal defender curled his effort over the wall and squeezed it between Gianluigi Donnarumma and the near post to give Parma a deserved point and hand Milan a setback in their quest to qualify for next season's Champions League. Fabio Ceravolo and Alessio Romagnoli battle for the ball at Stadio Ennio Tardini. Andrea Consigli's penalty save ensured he was the star man in Sassuolo's 0-0 draw against Parma at the Stadio Citta del Tricolore.